Before starting your job search it's a good idea to review how you usually roll. What is your usual MO when it comes to managing a project that requires planning and doing over time? Do you get on with it quickly or procrastinate? Once underway do you move fast or slow as a snail? Do you experience productive periods where interest and excitement are high, followed by downer periods where almost nothing gets done? It's my experience that personality really comes out during the process of job searching. Job seekers find themselves frequently outside of their comfort zone resulting in distress, even panic. People hit the reset button and revert to their usual ways of behaving when this happens. After all, personality appears to be a matter of wiring not unlike the factory settings on a new TV set. The default sets for a flat screen are (relatively) easy to change. By comparison, a person's base settings are not. Personality defaults lead to behavioral patterns and choice preferences. Everyone has these innate presets, however we shouldn't assume they serve us well in all situations. 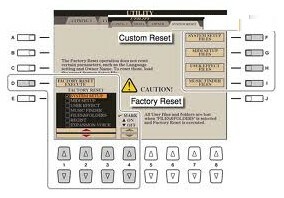 More to the point, will your own factory settings be helpful to you when it comes to achieving your Job Search Objective? Sadly the answer is no or not really in many cases. People want to achieve but they don't want to tweak the factory settings to make it happen. Rather than making the end goal the driving force, they want to go about things in the same old manner, in effect making the same old way of doing things the end goal. You cannot think your way to adjusting your default settings, you must do it and this involves overriding the presets. This alone doesn't really change anything, its more like temporary overwriting. Experts in behavior modification know that consistent and sustained doing of new behavior can literally re-write the defaults. The new behavior simply becomes the behavior. This takes time. For now, act it out as if playing a part. Focus on the desired outcome and play the role of the one achieving it. Below are four considerations to help make it different this time. Place emphasis on doing the following even though it's not your usual way. Set your speed to match the distance you wish to cover so that the high energy/highly productive days are flattened and the lower energy/less productive days are enhanced. In other words, pace yourself. Don't stop, don't go in reverse. Stay mindful of each accomplishment in order to gauge your degree of momentum. Bottom line, keep moving forward no matter what. Stay tightly focused on your Job Search Objective and pound steadily away on it like a pneumatic hammer. Pace and momentum come into the picture here. Yes to keeping a steady pace, yes to maintaining momentum and yes to being methodical as a machine. And yet, stay heads-up and ready to navigate the sharp turn when it pops up unexpectedly. Make the turn and then get right back on track heading toward your goal.